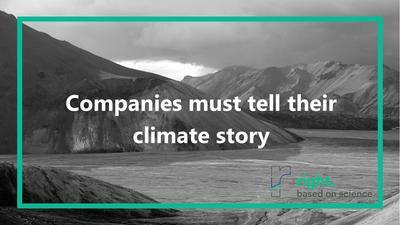 Companies’ contribution to climate change is factual, and law is now requiring corporate disclosure to enable an understanding of this impact. In the European Union, regulatory requirements were introduced last year using the Directive on Non-Financial Disclosures – from now on, the CSR Directive – asking companies to report on the impact their operations have on the environment. The first round of reports issued leaves a lot to be desired. Stories are inconsistent, disclosures boilerplate and information regarding risk management of disclosed factors are somewhat vague, making an understanding of the impact of corporate behavior on climate change, hard to decipher. Science-based climate metrics could provide an alternative, enabling companies’ disclosures to be relevant and telling. “A good hockey player plays where the puck is. A great hockey player plays where the puck is going to be! ", held perhaps the world's greatest hockey player, Wayne Gretzky. Just as a great player understands the playing field, a great entrepreneur understands his company, his market, and his stakeholders. The latter is increasingly alert as companies in which they invest, for whom they work, whose business partners or customers they are, shape the transition to a business environment shaped by a changing climate. No longer a voluntary practice but rather a legal obligation is born through the drafting of the so-called non-financial report. From now on, following the CSR Directive, certain large, capital-market-oriented companies, as well as individual insurance companies and financial institutions, are required to report on non-financial aspects of their company´s doing as part of their duties regarding Corporate Social Responsibility ("CSR"). Additionally, to provide a brief description of the company's business model, the central reference point for all other information is non-financial aspects, including the disclosure of environmental matters, such as greenhouse gas emissions which affect climate change. Whether they are incorporated in the annual, sustainability or as a stand-alone non-financial report, the disclosure of non-financial information must provide useful information to enable the understanding of the company´s business model, business performance, company´s position and the impact of the business´s impact on environmental matters. The non-financial reporting is also subject to a materiality requirement: It asks for the disclosure of risks that arise from the company's environmental activities and which are very likely to have or which will have a severe negative impact on ecological matters. The same applies to the significant risks associated with the company´s business relationships, its products, and services. In addition, they must state the intended way for managing these risks. However, the law does not define material risks. Within the German system, referring to the German Accounting Standard, the term describes possible future developments or events that could lead to a negative forecast or target deviation for the company. Predictions, in turn, are statements about expected developments and events. The first non-financial statements published up to now, show different levels of granularity regarding meaningful information on significant risks, especially when it comes to the consideration of climate risks. Several companies partly claim to anticipate the dangers of climate change, by setting themselves self-imposed climate goals, which are reviewed in intervals of up to 3 years to "align themselves entirely with global trends.” The legally required risk prognosis is, however, difficult to deduce from such passages and disclosures. In regards to disclosures on environmental matters, specifically those which ask for reportable greenhouse gas emissions, what must be understood is that what the regulator intends to grasp: the level of risk and impact derived from a certain level of emission issuance. Following this understanding, reporting greenhouse gas emissions in an isolated manner, without providing any context upon which to assess such information, might fail to be conducive to the purpose of the law. In order to aid this, science-based climate metrics can deliver an option to meet legal requirements as well as the intention sought by the law of enabling an understanding of the corporate impact on climate change. These science-based climate metrics can measure a connection between an economic unit and climate change, incorporating climate science findings. The pioneering work of the Science-Based Targets Initiative has received much attention in the area of science-based treatment of climate risks. Although a climate target can be set with a Science-Based Target, the legally required risk prognosis is not attained by the sole fact of establishing such a goal. Science-based climate metrics are suitable for objectively identifying and enabling key performance indicators ("KPIs") to work with them. The first science-based climate metric in the market, up to our knowledge, is the so-called X-Degree Compatibility ("XDC") developed by climate data providers. Based on science, the XDC informs a company about how many degrees °C earth´s temperature would increase to by 2050 if all companies were as emission intensive as the company in question (provided the same economic output). By using the XDC, environmental risks can also be reported by an easily understandable figure. The XDC model can also prove handy by modeling and reporting risks, derived from impact and exposure to climate change. Additionally, it enables the calculation of the effects that specific investments could have on the company´s climate target and thereby allows a coherent risk forecasting. It's fascinating to witness the moment in which a player heads to the precise place where the puck will be – the crowd is raging frenetically. There is no difference with the economic playing field, where true entrepreneurship will be evident in the transition to a <2 °C world. The non-financial statement – in line with the Action Plan for a more sustainable financial system developed by the European Commission – has the potential of creating transparency about how companies deal with climate-relevant risks. However, in order to assure the measurements of such risks are relevant and bear a relationship with the actual physical world they are having an impact on, sound and science-based climate indicators are pivotal. Marcela Scarpellini studied law at the Universidad Católica Andrés Bello in Caracas (Venezuela) and studied with an LL.M. at the University of Stockholm (Sweden) in the field of environmental law. Marcela is in charge of the legal aspects regarding 2°C-compatibility. right. Based on science is a Frankfurt (Germany) science-based climate data provider and a pioneer continually pursuing its vision with great curiosity. It has developed a science-based climate metric, called XDC (X-Degree Compatibility) which helps to get organizations into action as they can see the impact of their climate plans and activities.